Justin’s recent post on the best prison camp in America motivated me to weigh in on the same topic. Of course, the big caveat with my post is that I haven’t actually been to prison yet. But I sure have done an awful lot of research. We’ll soon see if that research paid off. In any event, I like to think of this post more as a primer on everything you need to know about federal camp system than a recommendation about which one is best. I was charged and sentenced in federal court under federal law, which means that I will also go to federal prison. Once the feds get you, they just don’t let go. But it’s not all bad. Although ‘Club Feds‘ ceased to exist long ago, federal prisons are generally considered to be better than state prisons. There are, of course, exceptions, but federal prisons overall, as I’ve learned, have better funding and uphold a higher standard of prisoner safety and comfort than state prisons. Unfortunately, that’s not saying all that much. Censorship is still strict. Not surprisingly, prisoners lose many of their rights once they are convicted. Even federal prisons are still in the dark ages when it comes to technology: they are one of the last places where typewriters still reign supreme. Thankfully, e-mail has recently been rolled out in many (but not all) federal prisons. From what I’ve heard, prisoners coming to an FPC from a higher security prison feel almost as if they are living in freedom – security is not as tight and there are generally no bars or wires. But white collar criminals coming in from the outside feel as if they are in a terrible, dehumanizing place. Just goes to show that where incarceration is concerned, it’s all about perspective. There are approximately twenty FPCs scattered throughout the country. The complete list can be found at the BOP web site. A small number are stand-alone while the vast majority are adjunct camps (satellite camps) adjacent to larger higher-security prisons. For friends and family who wish to visit, most of them are, unfortunately, located in the middle of nowhere. Only a very few are easily accessible to major cities, including one camp within an hour of Portland and another near Minneapolis. Prisoners entering the federal system have the ability, in a limited way, to influence where they are sent. BoP policy generally tries to place prisoners as close as possible to the release residence listed in their pre-sentencing report. As a result, it is important for defendants to make sure that the correct address is listed there. In addition, it is possible to request that your judge make a particular recommendation (as did mine, for the Lompoc camp). That said, there are no guarantees. The BoP has final say and makes their decisions in a typically mysterious bureaucratic fashion. 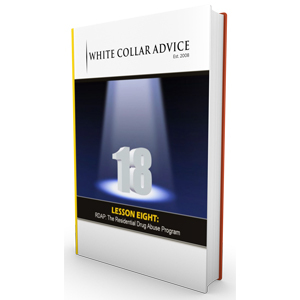 There are some other ways to influence the outcome, and some pitfalls to avoid, which is why it is so important to speak with a consultant such as Justin as part of the process. So which camp to request? That’s a difficult question, one that a prison consultant will weigh in on with more authority. While there are differences, as best I can tell they are not drastic. It is not as if you will be playing golf and swimming in a pool at Camp X and shoveling dirt in Camp Y. All the camps share basic (strict) rules and guidelines. However, there are some theories about which are better. Justin is a proponent of his alma matter, Taft Prison Camp, for the reasons he discusses in his blog, including the fact that it is privately run. In interviews, Alan Ellis says his primary consideration is whether the camp is stand-alone or satellite (the theory being that guards in the stand-alone camps are more relaxed). You can find his top ten rankings online. Another consideration is whether you qualify for RDAP, the prison drug treatment program. If you do, you will most likely want to request a camp that provides it (not all do). So then what does that leave us with? Location and weather, at the least. Some former convicts I have spoken with said that they based their request on the weather: so long as they were serving time, they decided, they might as well serve it somewhere nice and warm. All things considered, I suppose I would rather see palms through the bars than snowdrifts. I assume, though, that for most convicts, location is the most important consideration. For me, that and RDAP are what it’s all about. If I’m placed in some small town in South Dakota (and there is Yankton Federal Prison Camp located there, considered one of the best) I will never see my friends and family. If I am placed in California, than at least I have some hope. I’ll find out in a few weeks or so whether my attempt to receive a placement near to my family will be successful. For now, though, I will continue to wait with fingers crossed. If your considerations are similar, I encourage you to start out on the Bureau of Prison’s web site to determine which camp is closest to home. There are many other related issues to consider. For example, many people are surprised (I know my family was) to learn that you need money to survive in prison. Another is whether or not to speak with the guards. Yet another is what to say about your crime while inside. But these are issues better left for another day, that day when I’m actually inside those walls looking out. 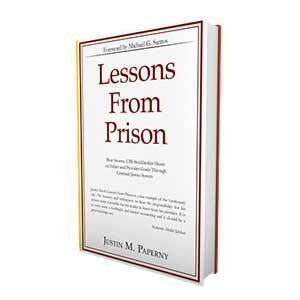 If those issues are of concern to you now, I encourage you to contact Justin and grab a copy of his book, Lessons From Prison. Leigh, I am so pleased you have agreed to share your wisdom and insights on this site. Walt and I are looking forward to working with you, and following your journey from one side of prison boundaries to the other. Please keep writing. We can all learn from you. Thanks to all for the writing of this blog. I am facing self reporting on June 23rd and am awaiting notification where I will go. I have been fed a lot of information and am not sure who to believe anymore. To say this is a nightmare is an understatement. thanks for writing Philip. Congrats on book. Please send me a copy when you are done, and I will write a review for my readers on this site, and my new site launching this Friday at http://www.FederalPrisonAdvice.